Beginning mid 1966, Steed spent at least three years at 3 Stable Mews. Amazing he stayed that long, for IMHO all of the orange pine paneling makes this flat quite garish. Eyestrain notwithstanding, for the first time Steed has a dining area that is separate from the living space; it is located just behind the fireplace in the top panorama view. 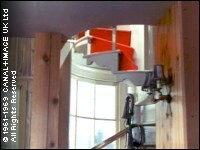 At left is a glimpse of the kitchen, and below that is a peek up the spiral staircase. Next are two interesting exterior Stable Mews views. 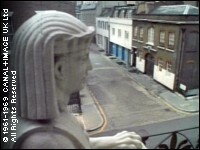 As near as can be determined based on shots in certain episodes ("Legacy of Death" for example), Steed's flat is in the second floor of the brown building in the bottom right image, even though the interior could not logically exist within any of the buildings based on its layout. 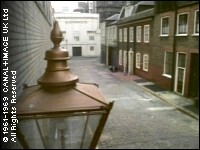 The actual exterior location is Duchess Mews, near Broadcasting House on Portland Place, W1. You can see some present-day images of this locale.